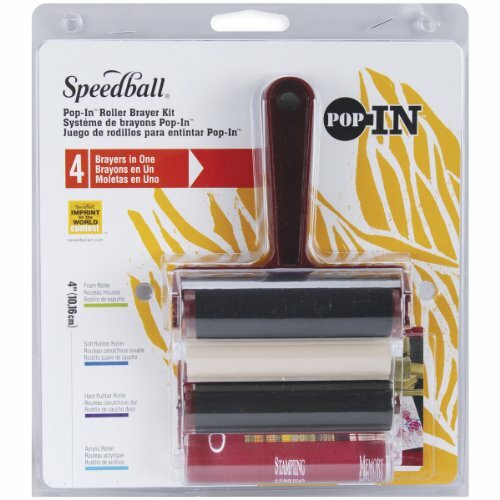 SPEEDBALL-Speedball Pop-In Roller Brayer Kit. Brayers are great for printmaking, scrapbooking, paper crafts, home decor, and much more! This 4in brayer kit comes with four rollers that are easy and quick to interchange. Foam Roller (black) for stenciling, acrylic roller (clear) for smoothing your glue surface for a bubble free tack, and a hard (black) and soft (tan)rollers for inking and embossing. Brayer has a burgundy colored plastic handle. Measurements: Brayer handle with no roller: 4-1/2x4-1/2x1-5/8in, rollers vary in diameter. Craft tips booklet by Dee Gruenig included. Made in USA.